UNAUDITED FINANCIAL RESULTS FOR THE QUARTER ENDED 30th JUNE, 2018. UNAUDITED FINANCIAL RESULTS FOR THE QUARTER ENDED 31st MARCH, 2016. UNAUDITED FINANCIAL RESULTS FOR THE QUARTER ENDED 31st DECEMBER, 2015. UNAUDITED FINANCIAL RESULTS FOR THE QUARTER ENDED 30th SEPETEMBER, 2015. AUDITED FINANCIAL RESULTS FOR THE QUARTER ENDED 31st MARCH,2018. UNAUDITED FINANCIAL RESULTS FOR THE QUARTER ENDED 31st DECEMBER, 2017. UNAUDITED FINANCIAL RESULTS FOR THE QUARTER ENDED 30th SEPETEMBER, 2017. UNAUDITED FINANCIAL RESULTS FOR THE QUARTER ENDED 30th JUNE, 2017. AUDITED FINANCIAL RESULTS FOR THE QUARTER ENDED 31st MARCH, 2017. UNAUDITED FINANCIAL RESULTS FOR THE QUARTER ENDED 30th SEPETEMBER, 2016. AUDITED FINANCIAL RESULTS FOR THE QUARTER ENDED 31st MARCH, 2015. UNAUDITED FINANCIAL RESULTS FOR THE QUARTER ENDED 31st DECEMBER, 2014. UNAUDITED FINANCIAL RESULTS FOR THE QUARTER ENDED 30th SEPTEMBER, 2014. AUDITED FINANCIAL RESULTS FOR THE QUARTER ENDED 31st MARCH, 2014. 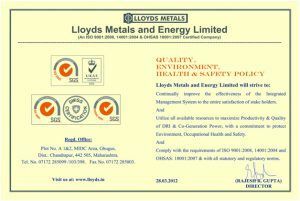 AUDITED FINANCIAL RESULTS FOR THE QUARTER ENDED 31st MARCH, 2012. UNAUDITED FINANCIAL RESULTS FOR THE QUARTER ENDED 30TH SEPTEMBER,2011. AUDITED FINANCIAL RESULTS FOR THE YEAR ENDED 31ST MARCH 2011. UNAUDITED FINANCIAL RESULTS FOR THE QUARTER ENDED 31ST DECEMBER, 2010. UNAUDITED FINANCIAL RESULTS FOR THE QUARTER ENDED 30TH SEPTEMBER, 2010. UNAUDITED FINANCIAL RESULTS FOR THE QUARTER ENDED 30TH JUNE, 2010.